Hi all! 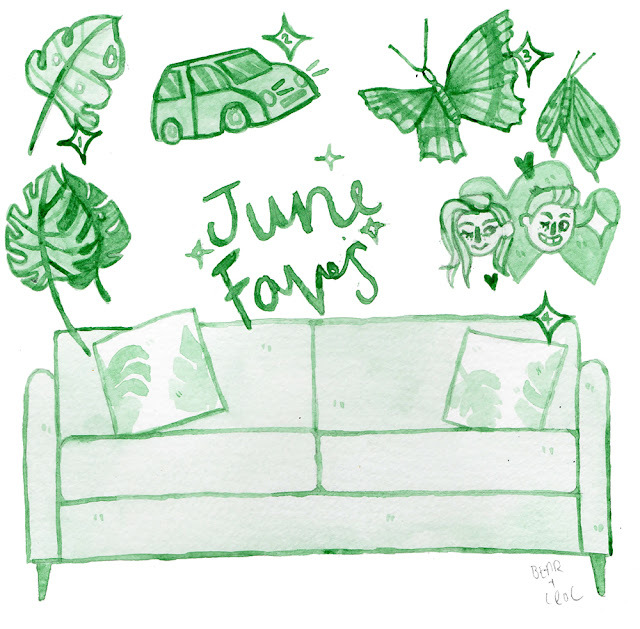 I very much enjoyed illustrating my favourites last month, so I thought that I would do another round up for the month of June. I wanted to be super organised and post them before we got settled into July, so here they are for you now! 1 - Tropical House Plants - As Sam and I get deeper down the decor rabbit hole, I'm getting more and more excited for the 'finishing touches', so to speak. We're a long way off yet, but I'm feeling super keen-o about the prospect of picking up little bits to really get the house feeling like ours. Number one on the list at the moment, shortly beating out coasters for the top spot, is the best greenery Homebase can offer. Cheese plants, Elephant's Ears, Ivy of all kinds-- I want it in a pot and I want it now. 2 - My First Car - If you've been following my driving chronicles you'll know this has been a long time coming. Sam has taken me out about five times to practice being the master of my own engine-- at the moment I'm still in the 'blind fear and panic' stage, but I'm slowly getting a little bit of confidence. 3 - The National History Museum Butterfly & Moth Exhibit - As you will know from my previous blog post on the subject, I recently visited the Natural History Museum's butterfly exhibit. It was childhood wish fulfilment all day long. I 100% recommend a visit (or you are also welcome to live vicariously through my photos). I know I've not been the only one obsessed with Love Island, because often when I watch it I'm also tweeting in perfect harmony with the thousands of other people who are 'hashtag'-hooked. The toastie drama, cupboard-gate, will-they-won't-they Scott and Cady-- it's just too much. I watch it with the fervour of a woman possessed. At the mo, it's Nathan/Cara or Tom/Sophie to win for me. Maybe even Alex/Olivia. Who knows! I'll be watching.